Mainline Waterproofing are the Original “Concrete Injection Repairers”. Brisbane’s first waterproofing specialists with over 25 years experience in the Brisbane, Gold Coast, and Sunshine Coast area. We provide a wide range of waterproofing services for both commercial and residential clients. Mainline Waterproofing are licensed waterproofing contractors specialising in concrete crack repair and an extensive range of other waterproofing services. Our services include the pressure injection methodology to concrete crack repair; concrete repairs; water leak repairs; large water ingress/egress sealing and slab jacking/stabilization. Other services include cementitious grouting; concrete repairs; waterproof coatings; epoxy floor coatings and swimming pool repairs with water storage. Our project managers and technical advisers have extensive experience and knowledge from working on many of Australia’s high profile construction projects, such as tunnels, dams, treatment plants, manholes, bridges, and mines. Mainline Waterproofing takes pride in its work and excels in delivering exceptional customer service whilst ensuring quality workmanship is guaranteed by our waterproofers across Brisbane. We offer free, detailed, personalised and competitive quotes, which ensures successful execution of each project. Mainline Waterproofing and the Director are BSA certified and comprehensively insured for your piece of mind. Mainline’s Waterproofing applications are undertaken to meet Australian AS 3740-1994, and furthermore, they are covered with an extensive product and workmanship guarantee. Concrete Slab Repairs, Concrete Crack Repair or Slab jacking is used as a specialty concrete repair or slab lifting technology. The Tufflon range of pure polyurea elastomers are tough, permanently elastic, spray-applied membranes making them the perfect choice for protecting and sealing steel and concrete surfaces. Mainline Waterproofing has extensive experience in the application of all types of waterproofing membranes. Trafficable Surface Coatings include; Concrete Hardening surface application, Epoxy surface coating, Concrete surface rejuvenation, and more. Mainline Waterproofing has extensive knowledge in waterproofing all types of stonewalls, from water ingress using pressure injection of polyurethanes, to the external surface of the walls. Mainline did an excellent job on our buildings basement. We had water entering the basement, the team quickly diagnosed the issue, came out at a time that was convenient for me and did a professional, efficient job. 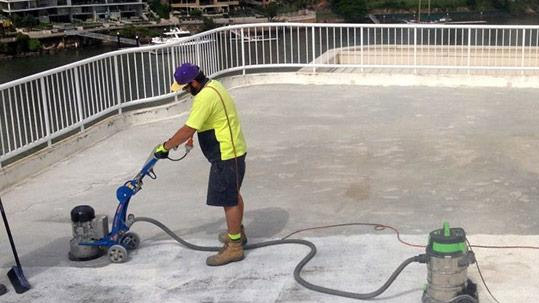 Mainline Waterproofing Contractors offer professional waterproofers in Brisbane and work regularly with a wide network of clients in a variety of industries.